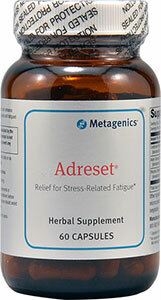 Adreset features standardized extracts of the adaptogenic herbs ginseng, rhodiola, and cordyceps targeting individuals who are stressed and tired. Cordyceps has been used for centuries as a revitalizing tonic for lung, kidney and heart problems. Scientists have discovered that cordyceps increases energy, stamina and physical performance. Some of these studies measured the body's levels of an energy chemical called ATP. ATP is the molecule your body uses to store energy. The more ATP in your cells, the more energy you'll have. Several studies have found that cordyceps can increase ATP in the cells. One study found that cordyceps increased the ATP ratio by a whopping 55%. But that's not all. Cordyceps has also been found to improve the way your body utilizes oxygen. One study found that cordyceps increases oxygen absorption by 40%. Another study found that rats given Cordyceps increased their swimming time from 75 minutes to 90 minutes. Cordyceps also strengthens the immune system by increasing the amount of the body's natural killer cells, which defend against bacteria and viruses. If you tend to catch colds easily or if they hang around for a long time when you do, Cordyceps can deliver the extra protection you need. In another study, researchers fed cordyceps extract to a group of rats. The scientists were surprised to see that Cordyceps caused a significant increase in hydrocortisone. Hydrocortisone is an essential adrenal hormone that your body uses to deal with all of the negative effects of stress. Cordyceps is also very heart healthy and seems to lower blood pressure and protect the heart from a heart attack. The heart needs regularity more than any other organ of our body. When the heart loses its regular rhythm, it’s life-altering. Cardiac arrhythmia is a condition of abnormal activity in the electrical impulses that manage the heart’s pumping sequence. The heart can beat too fast or too slow, regularly or irregularly. The heart may not be able to pump enough blood to the body, which can damage the brain, heart and other organs. With age, the risk of arrhythmia rises, and the condition becomes more common as people enter their 50s. The research materials published in the Journal of Alternative and Complementary Medicine suggest that administration of Cordyceps can lower high blood pressure and correct cardiac arrhythmia, extend its latent period and reduce the duration of cardiac arrhythmia attack. Numerous studies of people with chronic heart issues published in Journal of Administration of Traditional Chinese Medicine 5 show that the long-term administration of Cordyceps in combination with conventional treatments significantly improves general physical condition, mental health, sexual drive and cardiac function, compared to the control group who receive conventional treatments only. Particularly interesting is Cordyceps’ ability to educe coronary vascular resistance by 49% and the pressure in the lumen by 116% after the administration of the Cordyceps extract, which leads to increased blood flow in the vessels by 35% (the maximum increase is 100%). Cerebral vascular resistance was reduced mostly to 75%. In 1995, Chen investigated the Cordyceps extract on 34 patients with chronic heart failure, using echocardiography to compare their cardiac output to a control group of 30 patients who had received conventional treatment. After administration of Cordyceps, cardiac output increased by 60% and compared to only 25% in the control group. Cordyceps extract surpasses both modern anti-platelet agents, which are considered promising, as well as conventional medications for the treatment of the ‘number one’ killer – heart disease (CHD). Lou (1986) found inhibition of platelet aggregation by ADP and kolagene by adding an extract of Cordyceps.